Eat cookies all day and lose weight? It sounds crazy, but apparently Dr. Siegal’s Cookie Diet has helped more than ½ a million people lose weight since 1975. Dr. Siegal created his cookie diet based on the realization that when dieters are able to deal with their cravings with something healthy they are more likely to stick with the program. He concluded that hunger was the main reason people failed on diets. He originally created the cookies for patients of his Miami medical practice. For years they were only available to his patients but now they can be ordered online. Dr. Siegal states that his cookies are scientifically designed to help to control appetite and reduce hunger. 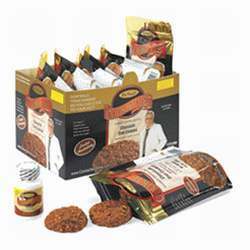 Each cookie contains 90 calories and contains low glycemic index ingredients such as whole wheat flour, bran and oats. However the main reason he says they work is due to a secret blend of amino acid proteins. There is actually some scientific basis to this as proteins have been found to have a greater effect on appetite reduction than carbohydrates and fat in the diet. Dr. Siegals cookies can be used with any other diet. They are recommended as a healthier alternative to other snacks or to reduce hunger when following any diet while under a doctor’s supervision. Most dieters report that the cookies are edible but not the tastiest. Even Dr. Seigel’s website states that ‘we wouldn’t call them delicious’. They say delicious cookies make people fat and there certainly is some logic to this as dieters are less likely to overindulge in average tasting cookies. The cookies are available in 5 flavors including: Chocolate, Oatmeal Raisin, Coconut, Banana and Blueberry. Dr Seigal advises his patients to eat six cookies throughout the day whenever hungry. The cookies are the only foods eaten all day and then the patients are ‘rewarded’ with dinner. He recommends a high protein dinner containing up to 6 oz of either chicken, turkey, fish and other seafood with one cup of vegetables. Red meat is not recommended because of its high fat content. Total calorie intake averages around 800 calories per day. Dr Seigel says this gives fast results and increases motivation to stay on program. Once you’ve reached your target weight you can continue the cookies during the day but just increase the calories in the evening meal so as to maintain the weight loss. He does emphasize that this diet plan should only be undertaken with the agreement from a doctor and under medical supervision. Cookies are packed in boxes containing 42 cookies packed in 7 daily bags which will last for one week if the diet is followed according to the instructions above. The price is $56 US plus shipping and handling. Good for dieters that crave sweets. Reduces hunger and helps to control portions and calories. Must be undertaken under medical supervision. Nutritionally inadequate and lacking in protective nutrients from fresh unprocessed foods. Contains no fruit and only 1 cup of vegetables per day. Impossible to obtain minimum requirements for many nutrients including fiber. Calorie levels are well below that recommended for safe and effective weight loss. Low dietary carbohydrates are likely to cause fatigue. Lacking in variety and may produce dietary boredom. No exercise or lifestyle advice. Weight loss is likely to be regained easily when normal diet is resumed. While there is no doubt that such severe calorie restriction will produce results for most dieters, experience has shown that around 95% of dieters will regain the weight lost with such extreme methods. Such a rapid loss of weight is associated with many health risks and the calorie content is so low that it is impossible to meet daily minimum requirements for most nutrients. See how this plan compares with other Diet Cookie Plans. I am receiving my Smart for Life 2 week supply in the mail tomorrow. I paid 89.00 on Walgreens websit, free shipping, compared to 59.99 for 1 week on their website. I do not like any kind of meat or fish. What can I eat for dinner? Can you substitute oreos and still lose? Does anyone have a recipe for diet cookies like Smart for Life? Or any other brand? Does anyone have a recipe for these pricey cookies? Hope anyone that is trying to shed some pounds try this because it WORKS! I tried The Dr. Siegal cookie diet and the cookies tasted terrible. I liked the concept of eat cookies so then I heard about Smart for Life also a cookie diet, I went in to the center and tried the cookies which that is something Dr. Siegal does not do they do not let you try the cookies. The cookies are much better on the Smart for Life program and they also have shakes, soups, pudding, etc. If you did Dr. Siegal and felt the same way I did, do not give up try Smart for Life cookies they are much better and they work. Not a bad diet, once you get used to the taste. Just don’t expect “cookies” expect “diet cookies” and you won’t be disappointed. I lost 10 pounds the first week. This diet was definitely in my top 100- rated very high i’d say!! !